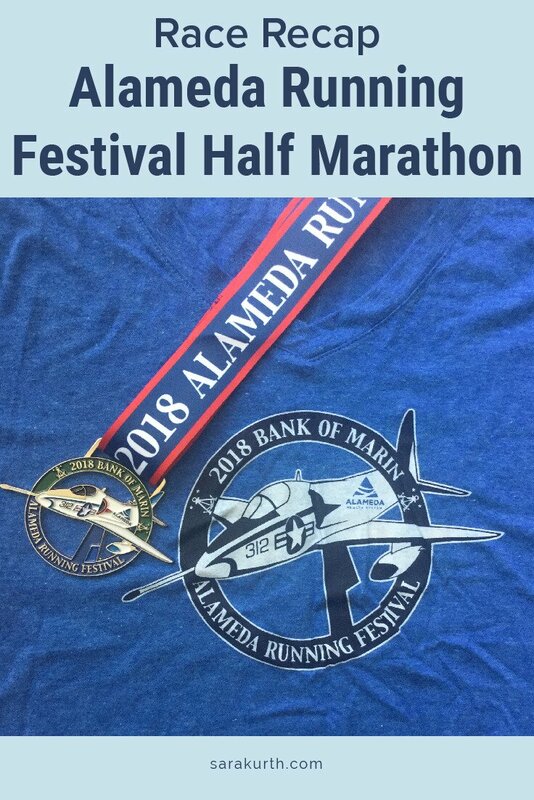 I hadn’t planned on doing the Alameda Half Marathon. I did the Drag-n-Fly Trail Half the day before, and while I had back-to-back long runs planned (thanks ultra training!) Back-to-back races seemed like a bit much. But I got an SOS email earlier in the week. My running club organizes the pacers for the Alameda Half, and the scheduled 2:30 pacer had to drop out. They needed a replacement. I had to run anyway, and the 2:30 group means running an 11:21 pace, which is a very comfortable long run pace for me. Even if my legs were dead after Drag-n-Fly, I am confident in my ability to run (and pace) an 11:21 minute/mile. It is going to be hard enough doing back-to-back races, but I’m not going to do myself any favors with my post-Drag-n-Fly recovery. I’ve gotten another last-minute request to help at a local pet fair with an animal rescue agency I volunteer with the afternoon after Drag-n-Fly. So instead of resting and rehydrating, I’m going to be on my feet (probably not drinking enough water) helping kittens get adopted. Good for the kittens, maybe not so much for my legs. As a pacer, I have one goal, finish in 2:30. The weather was perfect for race day: 60s at the start. Upper 70s at the finish. The geography of Alameda baffles me. I generally have a really good sense of direction, but this is the one part of the world where my sense of direction is worthless. I get so turned around every time I’m on the island. This race was no different. The course loops around all of Alameda, and I had no idea where I was in relation to anything for the whole race. This is great for runners, but not so much for pacing. I fought to stay consistent. While it’s normal when pacing to have to adjust your pace a little in the last few miles, this is the most I’ve ever had to slow up near the end. I didn’t have to walk or actually stop running like some not-so-great pacers do (I think that’s cheating as a pacer – you should do the correct pace all throughout the race, not go too fast and stop in front of the finish line for 5 minutes so it looks like you hit your time). I was in the ballpark, but there were more last mile adjustments than usual. One of my road race pet peeves is when the entire race field is corralled into a super narrow course, especially when it happens in the first few miles when we haven’t spread out yet. This isn’t NASCAR and I’m a middle-of-the-pack-runner. I shouldn’t have to jockey for position. For much of the first few miles of this race, we had to run on a single bike lane on the side of the road. The cones were on the inside of the line, and the curb was severely angled. This left us maybe 3 feet to run. We basically had to run single file, with maybe room to pass (but if anyone ran side-by-side, there was no passing room). I’ve done single track trails that are wider. I get needing to keep roads open to traffic, but this was a 4 lane road. It was 7:30 on a Sunday morning, there were zero cars on the road. You couldn’t have given us 1 lane of traffic? When I’m running a race as a civilian, this is just annoying, but when I’m a pacer, it can actually become a problem if I get boxed in and I’m running the wrong pace. This was an interesting 1-2 half-marathon punch with Drag-n-Fly. One was the hardest and hilliest around, the other was the flattest and fastest around. Complete polar opposites of the racing spectrum. Physically, this race was utterly uneventful (that’s a good thing). Drag-n-Fly and the pet fair didn’t impact how I felt today at all. I was well prepared and well hydrated. Mentally? Mentally, I was a bit of a mess. I was annoyed by the super-narrow course. I was annoyed that for the first few miles the sun was super-bright, right on the horizon, and shining directly in my eyes. Many (most?) of the mile markers weren’t in the right spots, which is a huge issue for pacers. Sure, I have my Garmin, but Garmins vary and it’s best to gauge pace using the official markers of the race. But you can only do that if they are in the right spot. 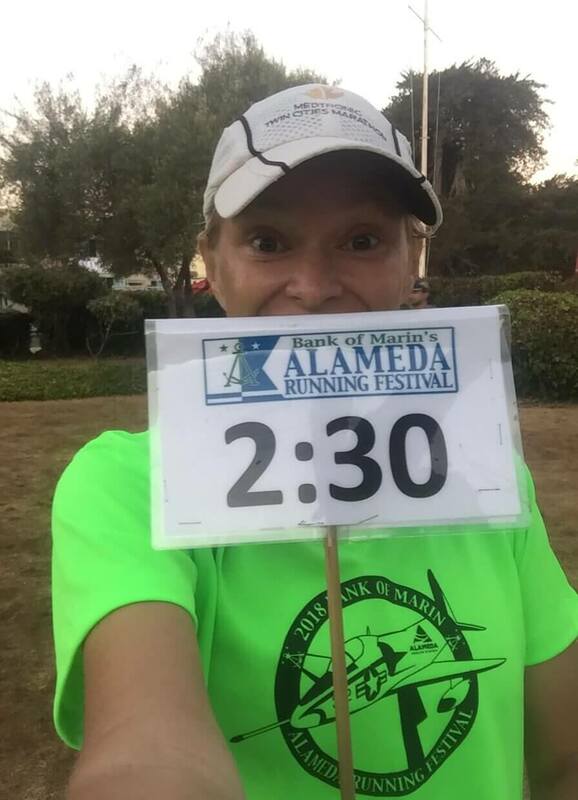 For Alameda, the first mile was accurate, the second was way long. I was running basically the same pace, but one marker I’d be 1 minute fast, the next I’d be 2 minutes slow (while I’m not a metronome, I know I didn’t vary my pace that much). Which one is right? No idea. But it sounds like we were in a better position than the 5k runners – roughly the first half of that field went off-course because of poor (or missing) signage. So I guess it could have been worse. I had a few people running with me, but they were all wearing headphones. I always find this awkward. They are running right next to me – not talking to them feels weird, but talking to headphone wearers feels weird too. Kudos to the Alameda Half for still having plenty of food for the last finishers. This shouldn’t be a surprise or something worthy of being called out, but sadly, it is. 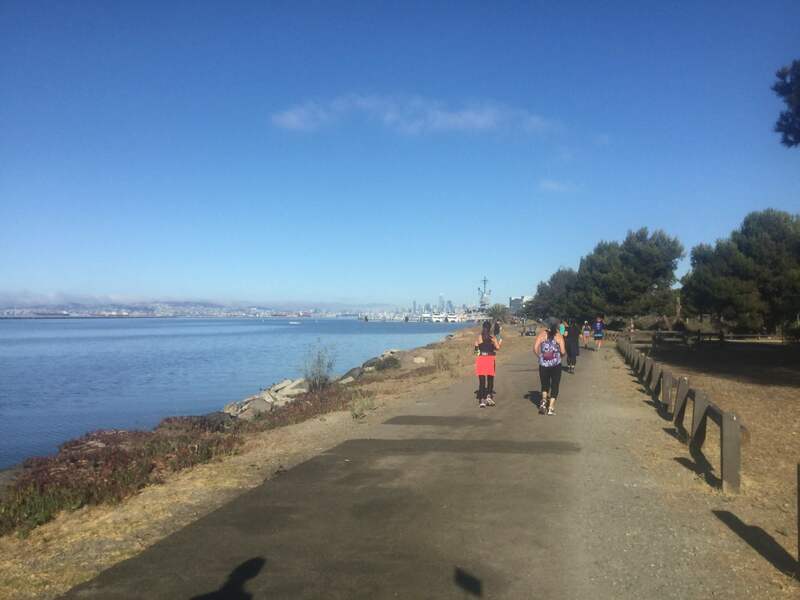 And Alameda had lots of post-run food – PB& J, burritos, chips, granola and milk, many kinds of fruit. Good spread and I’m (pretty) sure I got all of it. I nailed it – I finished in 2:29.36. For pacing, what is important is chip time; but did notice my gun time was 2:29.58. For all my mid-run stressing, I need to trust myself a little more. I don’t know that I would run it just to run it, but it would be high on my list if I ever want to set a new half marathon PR. This tells you everything you need to know about the cumulative effect of my back to back races: I took a nap when I got home from Alameda. I hate naps. Even as a kid I didn’t like naps. But today, I got home and I could barely keep my eyes open. Rocky Ridge Trail Half. The half with the most elevation gain (that I know of anyway). It somehow manages to climb nearly 4000 feet in 13 miles. And then… the Oregon Coast 50k. It’s coming up soon… EEK!